NYC, 02/24/2019, 5:00PM. Music by Charles Ives and Other 20th and 21st-century Composers.. Classical Music | Music by Charles Ives and Other 20th and 21st-century Composers. Kyle Walker, piano; Emily Kalish, violin perform works by Charles Ives (1874-1954), George Walker (1922-2018) and other 20th and 21st-century composers. Pianist Kyle Walker has appeared at Carnegie Hall, Steinway Hall NYC, The Queens Museum, The Great Hall at Cooper Union, The House of the Redeemer, National Opera America, The Metropolitan Opera Guild, Birmingham Jefferson Concert Hall in Alabama, among others. 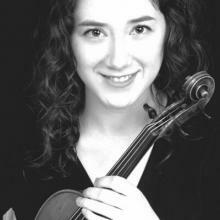 Violinist Emily Kalish has played under the baton of conductors Kurt Masur, JoAnn Faletta, Gerard Schwartz, and Robert Franz and currently holds positions in the Binghamton Philharmonic and Hudson Valley Philharmonic.